A parasol makes outdoor dining much more comfortable in the hot summer months, providing much needed shade from the sun. Most patio tables will include a parasol hole to enable a parasol to be fitted in the centre of the table. A parasol base is usually required to hold the parasol in position and prevent the parasol being blown away. Garden Oasis have a selection of parasols and bases to compliment your garden furniture and a cover to keep the parasol clean and protected when not in use. Delivery is fast and free to most parts of the UK. 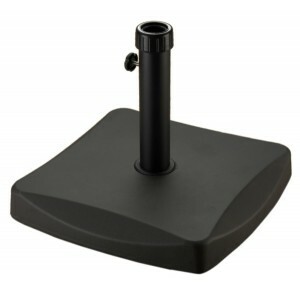 The 25KG Square Parasol Base by Royalcraft is the perfectly solution to securely using a parasol wit.. 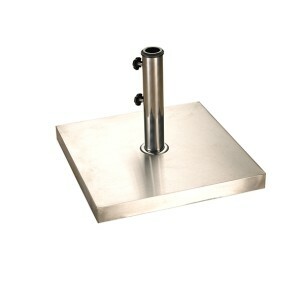 The Royalcraft Square Stainless Steel 25kg Parasol Base is the perfect way to safely hold parasols w.. 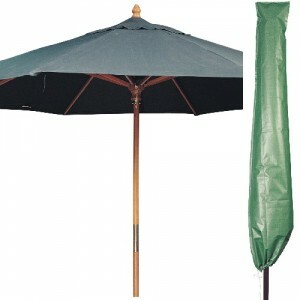 Protect your garden parasol against rain and dust with this high quality green laminated woven po.. 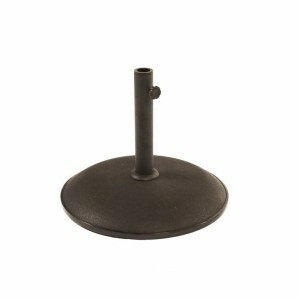 Ideal for positioning and securing your parasol, this metal and concrete base will accommodate an..